Underberg is an administrative town in a dairy and cattle farming community in the Umzimkulu River valley of KwaZulu-Natal. It is situated at the foot of the 1,904 m Hlogoma Peak in the foothills of the Southern Drakensberg, KwaZulu-Natal. Underberg was established in 1917 when the railway from Pietermaritzburg reached the area. It is an important commercial centre for the region's farming industry providing many of the support services. The town also houses provincial offices of Social Welfare, Transport, and a clinic; as well as the municipal library. The beauty of Underberg and the surrounding area is an attraction to travelers far and wide, making tourism in the area is the second biggest industry next to farming. The area surrounding Underberg provides a large variety of tourism offerings, being a gateway to the Southern Drakensberg. By the 1880's there was a shortage of vacant land for farming in Natal and the children and grandchildren of the 1820 and 1840 settlers were looking for land of their own. The land along the Southern Drakensberg, an undeveloped area, was about the only land left unclaimed. It was an isolated and cold part of the country consisting of open grassy rolling hills that ascended,into the mountains. Without trees, except up in the south facing kloofs of the mountains, there was no firewood which made life hard for settlers who would have to fetch fuel from far away in order to cook and heat their homes. It was described by all the early explorers who passed through as inhospitable, cold and uninhabitable. Farming was very hard in the cold and isolated land of Underberg. It took between seven and ten days for an ox-wagon to get to Pietermaritzburg and the produce market. Two days hard riding on a horse. The rinderpest of 1895 wiped out a great many cattle and stranded many of the transport riders as well. Then the locust plague of 1896 was the final straw for many who gave up and moved to easier farming areas, so few of the original settlers remained by the end of the decade in 1899. The outbreak of the Boer War in 1899 saw many of the farmers being called to arms with the Border Mounted Rifles and most of the Underberg men were involved in the siege of Ladysmith. The hostilities, however, were confined to the northern parts of the colony and no fighting ever took place in the Underberg area. A new wave of arrivals had taken over from where the original settlers had left off. 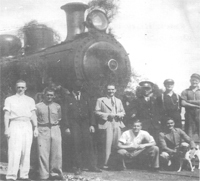 Communications began to improve, roads were begun and a regular 'Post Cart' service ran between Underberg and Pietermaritzburg carrying mail, passengers and small parcels. Farming was still hard, the climate did not lend itself to crop farming and the grass provided little sustenance to cattle and sheep in winter when crude protein levels in the grass dropped to almost nil. Summer grazing however was good, and fattened the stock nicely. Communications were improving, roads being constructed and the post cart was well established. The railway line reached Underberg in 1916 allowing farmers at last a ready access to markets and thus made farming more profitable. The First World War interrupted this decade and drew a lot of the young farmers away to the war, leaving their wives or relatives to run the farms. The decade ended with the influenza pandemic which claimed a great many lives all over the world and even in the Underberg district. The 1930's began with a disastrous drought which lasted three long years. The drought led to the construction of the bridle path system in Basutoland by Maj. Harry Smith, the po­lice officer in charge at Mokhotlong in Basutoland and he accomplished this for the sum of only 60 pounds. The drought broke in 1933. It was a difficult period with the great depres­sion that financially ruined many people. Sheep could be bought for five shillings (50c) and if they were shorn, they were worth three shillings and sixpence (35c). The wool accrued in value and some people actually made money. The Second World War years were a difficult period for many whose men were away. A number of farms changed hands, especially after the war ended in 1945. 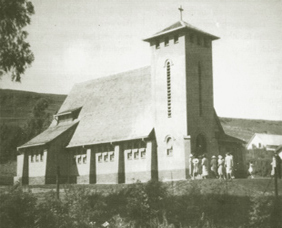 The Natal Parks Board was formed from the old Natal Provincial Association Wildlife Department and took over control of fishing in 1947 and in 1949 the Underberg Congregational Church was built and opened during the ministry of Rev.Hedley Park. 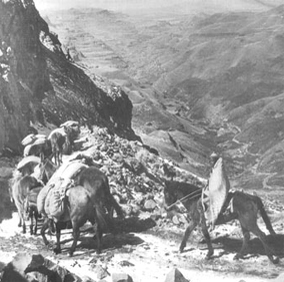 The Sani Pass, traditionally a pack animal route to the interior of Basutoland (Lesotho), was opened to vehicular traffic and this increased trade with Natal and allowed for phenomenal development in Mokhotlong and surrounding areas. The village main roads and the road between the two villages were tarred in 1959 and a by-pass built at the en­trance to Underberg. This came straight down the hill - instead of veering off to the right past the Un­derberg School and the Underberg Congregational Church and down what is now known as Old Main Road. 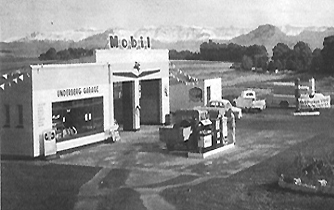 May 1959 saw the great snowfall that blocked the Sani Pass for three months. The heavy rains, lasting for three days, washed away bridges on the South Coast. The road to Underberg was cut off for 24 hours by the floods. The Underberg Bowling Club was formed in 1953 and greens laid out in Underberg and the Underberg/Himeville Fishing Club was formed in 1954 and the Coleford Nature Reserve was officially pro­claimed on 11th May 1955. After Kenya's independence in 1963 there was an influx of farmers, most of which found farming conditions in Underberg too harsh and moved off again after a few years. New and more ef­fective remedies for parasite control in sheep made sheep farming more profitable but jackal problems began to be more acute and a number of new jackal hunt packs were started. In 1969 someone wrote in the Sunday papers that Underberg was the 'in' place and overnight property prices doubled and then quadrupled. Some buyers were soon disil­lusioned and with the poor roads the area was still perceived as remote. The Dragon Flying Company who flew flips and charters along the Drakensberg,went out of business in 1969 after its Cessna 182 was wrecked in a field near Bushman's Nek. 1962 brought heavy snow falls and interrupted certain public services. The Underberg Golf Club was formed in 1961 and in 1966 became the Underberg Country Club incorporating the cricket ground and became home to the Underberg Cricket Club. Situated on the edge of Underberg village towards Kokstad, it has a stunning view of the mountains. Round Table No 152 was formed in Underberg in 1969 and has supported Pevensey Place, the home for cerebral palsied adults, and many other charities, ever since. The Natal Provincial Administration finally started work on tarring the road from the Impendle turn-off to Underberg which had been promised since 1947. It was finally completed in 1972. 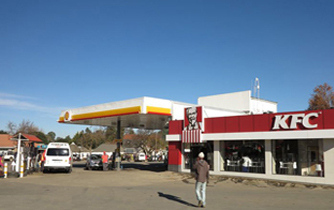 The new tar road and the arrival of Eskom in 1977 set off a wave of change in the area. The cheese factory closed and fresh milk was sent directly to Pietermaritzburg and Durban. Electricity enabled irrigation to become common, increasing yields especially in the dry winter months. Stock theft however became a bigger problem and farmers began to give up farming sheep; selling their farms to timber companies was a temptation that some could not resist. Whereas there had been a sheep sale every month of the year there was now only a sale in December and even that was dropped after a few years. A housing boom prompted farmers to sell off portions of their land as smallholdings. A new hall was built for the Underberg Farmers' Association; this incorporated the old hall in what became the stage and supper room. 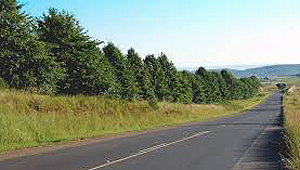 The Garden Club arranged the planting of trees between the two villages in 1970, in an endeavour to unite the Underberg and Himeville factions. These two groups were finally united by decree in 2000 and both became part of the KwaSani Municipality. 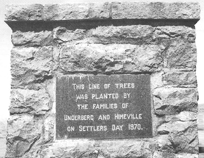 ON SETTLERS DAY 1970 ". 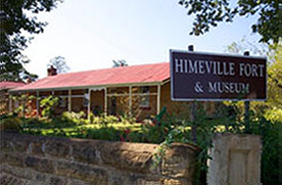 Some important dates in the 1970's include, the Himeville Nature Reserve was proclaimed in 1973, the last passenger train ran from Underberg to Donnybrook on 2nd December, 1974, SABC Television transmission arrived in Underberg in 1975 and the Himeville Fort was declared a National Monument in 1978 and became the Himeville Museum. This period ended with the unprecedented rains of September 1987. They caused havoc in Natal and dumped five feet of snow on top of the mountain. The Basuto suffered heavy losses: some 40 000 head of sheep, goats and cattle and ten herd boys caught in the mountain cattle posts died. The Sani Pass was closed for three weeks and due to washaways by run-off from the melting snow it took another three months to repair the 'road. In Natal many bridges were washed away, property was damaged and lives were lost in the floods. Despite the phenomenal rains the summer of 1987 was one of drought as it didn't rain again until February 1988, when more heavy rains were experienced and the bridge over the Loteni river near the police camp was washed away. Underberg has grown into a truly significant little village and farming community. Thriving on tourism, Underberg is proudly known to many as the gateway to the Southern Drakensberg. Over the more recent years tourism to the Underberg area has increased dramatically creating many viable opportunities for the Underberg residents. The influx of visitors, especially over weekends, to the area has opened doors for restaurants, farm stalls, shops, accommodation venues and tour operators. Sani Pass is a huge draw card for tourists and and our registered Sani Pass tour guides have a continual flow of visitors wanting to take a four by four trip up Sani Pass for the day. A day trip up the pass includes a visit to the highest pub in Africa for lunch or a drink. Because of Underberg's popularity and location it has become home for many well known sporting and social annual events. The annual Sani2c mountain bike race has become a very popular event and competitors from all over the country take part. The Underberg Primary School caters for and accommodates the organisers and riders. Splashy Fen has become a huge musical event and turns Underberg into a hive of activity. Lasting five days, Splashy Fen also attracts visitors, mostly music lovers, from all over the country. The Drak Challenge Canoe Marathon takes place on the Umzimkulu river and has become a favourite for canoeists from far and wide. 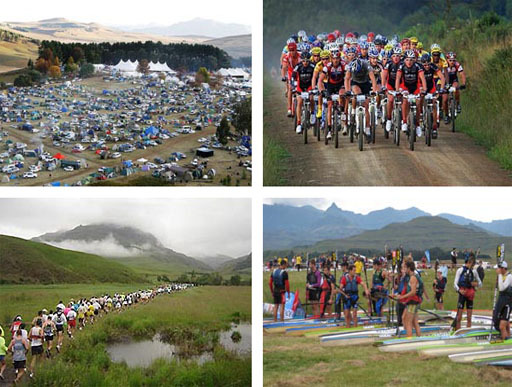 It is a two day event and Underberg is the base for the competitors and organisers. The Sani Stagger endurance race is becoming more popular by the year, starting and finishing at the Sani Pass Hotel. The race takes the runners up Sani Pass or the the border post between South Africa and Lesotho. The surrounding beauty is enjoyed by runners from all over the country.